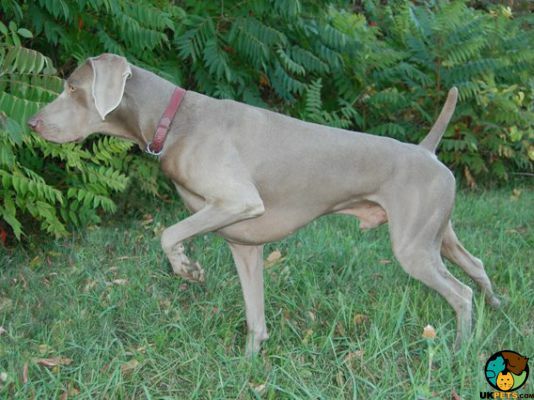 The Weimaraner is a graceful, loyal, and very brainy dog originating from Germany. This dog breed was bred to hunt big game, such as boars, bears, and deer. 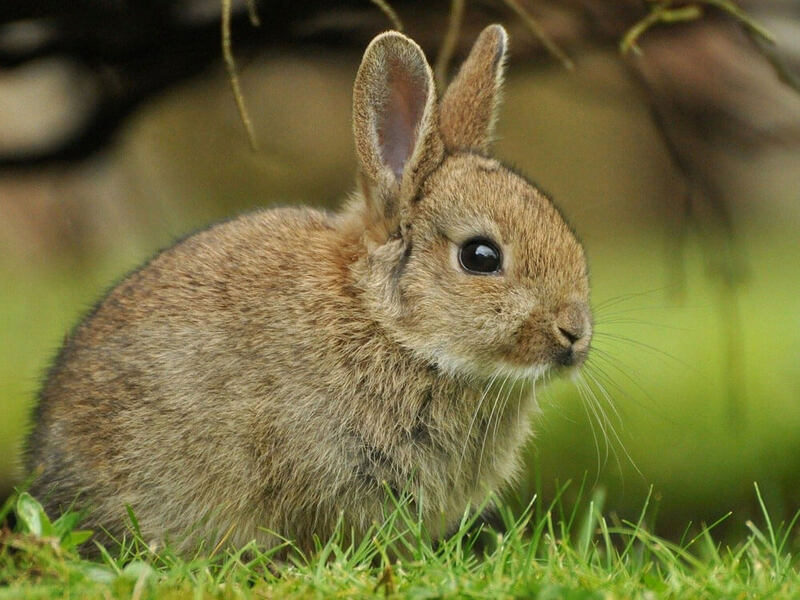 Over time, it has shifted to hunting smaller prey, such as rabbits, fowl, and foxes. It has also gained favour as a fantastic family pet for its ability to form strong bonds with its family. Lively, gentle with children, and good-natured, the Weimaraner Vorstehhund, as it is also known, has become popular as an all-around dog. The Weimaraner’s ancestry is quite a mystery. However, it has been speculated that its possible parent breeds go way back to the thirteenth century. The Chien-gris and the bloodhound have been thought to be ancestors of the Weim. The German short-haired pointer is also said to be a relative. Further, canine pets looking very similar to the Weimers were observed in Van Dyke paintings dating to the 1600s. 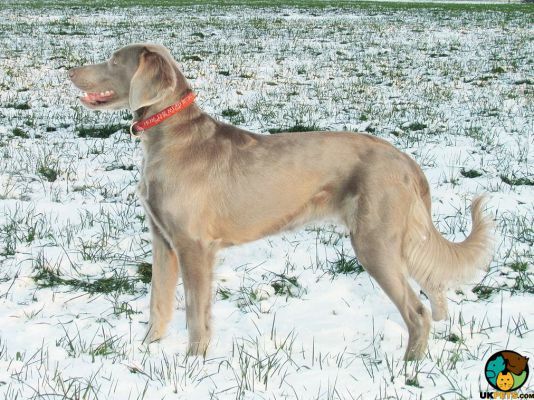 The Weimaraner breed was developed in Germany in the state of Weimar. It was developed for the Grand Duke of Weimar, Karl August, and thus takes its name after the state. It was bred for the nobility to hunt big game, such as bears, wildcats, deer, boars, and even wolves. However, when huge prey grew scarce in the country, the number of Weims also fell. Despite the downturn on the hunting front, the Weimaraner continued to survive as it was a hunting dog that lived with its family. This was regarded as an unusual arrangement as hunting canines were typically kept in packs and housed in kennels. As such, this dog is used to being in the company of humans and does not thrive well in kennels. A major reason for the mystery of the Weimer’s breeding history is due to the fact that the Germans kept it a secret. The nation was possessive of its prized, all-purpose canine. In fact, the first Weim brought to the US in 1937 was sterilised to prevent the spread of the breed beyond German borders. In later years, non-sterilised Weimaraners reached American shores. It was in 1952 that the canine was brought to the UK, thanks to Major Petty. Today, the Weim has grown in popularity in various parts of the world and has been used by the police and as assistance dogs. This graceful and handsome dog has a tall yet medium-sized body. Its average height ranges from 58–68 cm and its weight ranges anywhere from 25–37 kg. Its head is a bit long and sits proudly on a moderately long neck. It has a powerful jaw, grey nose, and long, high-set ears that fold downwards. Its eyes are medium, round, and set apart nicely on its face and have an alert and intelligent look. The light blue Weimaraner eyes typically occur during this breed’s puppy stage. As an adult, the Weim’s eyes transform into a grey-blue or yellow colour. The Weimer’s chest is deep and its loins are on the shorter side. It has strong, straight front legs and muscular back legs. These end in compact, well-padded feet and arched toes. Its tail is moderately long and is thick at the root. This breed is frequently docked in countries where the practice is not banned. Its silvery coat is short and sleek. It is also extremely low-maintenance. A bath every few weeks is sufficient to keep it in good condition. Its distinctive coat colour ranges from light silver grey to dark grey and is famous for creating a disappearing effect. As such, it has also been called the “grey ghost.” Such a smoky, silvery coat allows the Weimer to easily blend in the fog. 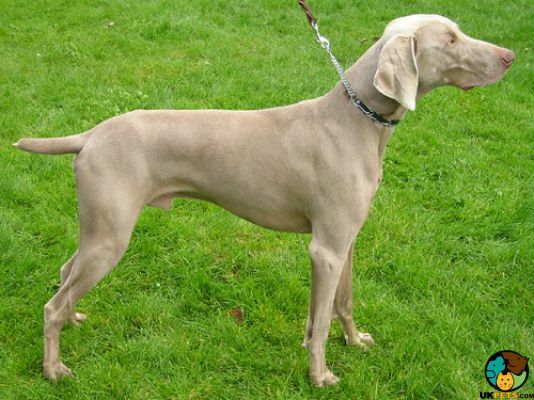 There also are Weimaraners with longer coats, with hair ranging from 2.5–5 cm in length. Whilst uncommon, these long-haired varieties were suitable for hunting waterfowl due to the added insulation. 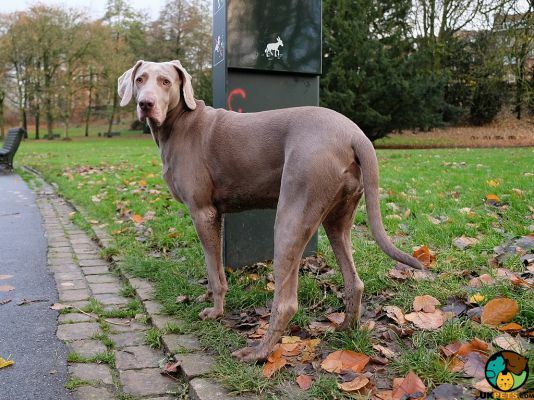 The Weimaraner’s temperament is famously energetic and demanding. It is a breed that has a profound need for hunting and bonding with its family. Its high prey drive is such that it may chase even animals it has already known, although it can learn to tolerate them. As such, it is not ideal for households with smaller pets. This dog is said to be amongst the most energetic of all hunting canines. It needs to be constantly kept busy as a bored Weimer is destructive. As such, it needs a lot of daily exercise and is thus ideal for those who lead an active outdoor lifestyle. Sensitive, eager to please, and supremely loyal, the Weimaraner is known to be very devoted and attached to its human family. It follows its owners from room to room and will develop separation anxiety when left on its own. The Weimaraner is gentle, sociable, playful, and generally good with children. As such, it makes a wonderful pet for active families. However, it is not ideal for city living. The Weim needs much room for running and thus will be suitable to the country side and homes with yards or wide landscapes. This canine has such a keen sense of smell that it has been used to sniff out missile shrapnel during the Cold War. It can handily sweep tracking competitions with its powerful nose, which is powered by half its brain. A very smart dog, the Weimer has been called “dog with the human brain” and is thus easy to train. As such, it needs to be constantly challenged mentally. As it has a stubborn streak and a tendency to think independently, the Weim is not recommended for first-time owners. Ideally, this dog should be trained and socialised early on. Follow a set feeding schedule consistently and provide the same food to your pet to avoid gastrointestinal problems. However, if you need to change its diet to another type of high-quality food, do so gradually. This allows your dog to adjust accordingly without complications. Puppies must be fed 3–4 times a day. 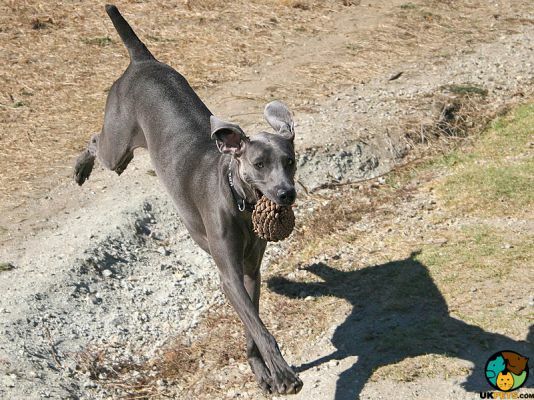 Adult Weimaraners should be fed twice a day, but in small meal portions as they are prone to bloat. For a Weimer puppy that’s 2–7 months old, feed it 264–506 g of food daily, depending also on its size and activity level. For one that is 8–10 months old, feed it 374–402 g of food daily. For a Weim pup that is 11–14 months old, provide 290–357 g of food. When it turns 15 months and beyond, you can give it adult food. The adult Weimaraner weighing 25 kg should be fed about 276–363 g of food daily, taking into consideration its activity level. If weighing 30 kg, offer 307–404 g of food. For one weighing 32–37 kg, give 322–482 g of dog food. Being a very intelligent and active breed, the Weimer should be exercised for at least 2 hours daily. The activity should involve a combination of mental and physical stimulation. To buy a well-bred Weimaraner puppy, you may expect to spend at least £400–£900. Insurance may cost about £30 (basic) to £67 (lifetime) monthly. The food expenses may cost about £40–£50 per month. For vaccinations, boosters, annual checks, and other veterinary costs, pet care expenses may add up to more than £1,200 annually. On average, a Weimer owner will spend about £80–£120 per month. The insurance costs can also influence these cost estimates. For its lifetime (11–14 years), the costs can range from £10,560 to £20,160 overall. This estimate does not include the expenditures incurred in acquiring a Weimaraner for sale, though. The Weim is a lively, highly active dog needing a lot of exercise and mental stimulation. Its sensitivity and independent thinking requires an experienced and firm hand. As such, this dog is not suitable for first-time owners. Its sleek coat is extremely low-maintenance. This dog is so devoted to its human family it will “shadow” its owners around the home. It is thus prone to separation anxiety. This canine is a wonderful pet for active families with spacious grounds.